Annie lost a tooth—and her belief in the tooth fairy—on the Sunday before MLK day, still a few weeks shy of her tenth birthday. Her absolute faith that the tooth fairy and her father weren’t the same person had been shaken, and that became evident when she asked me to talk. We were at the Rubin’s house for dinner when she overheard a snippet of conversation and began connecting dots that previously had not aligned. I took her to the living room to talk away from the group. Her eyes darted around the room with the occasional piercing glance into my eyes. There was more silence than usual. She was thinking of the right question to untangle the deception before her. “Yes, it’s usually me,” I tell her. We sorted through a massive re-calculation of what is and isn’t true: unicorns (probably true), narwhals (yes true), the Easter bunny (not true), elves (not true). That night, Jane and I had made the decision to allow Annie to watch some episodes of The Office – to soothe her and to allow her to get really tired. 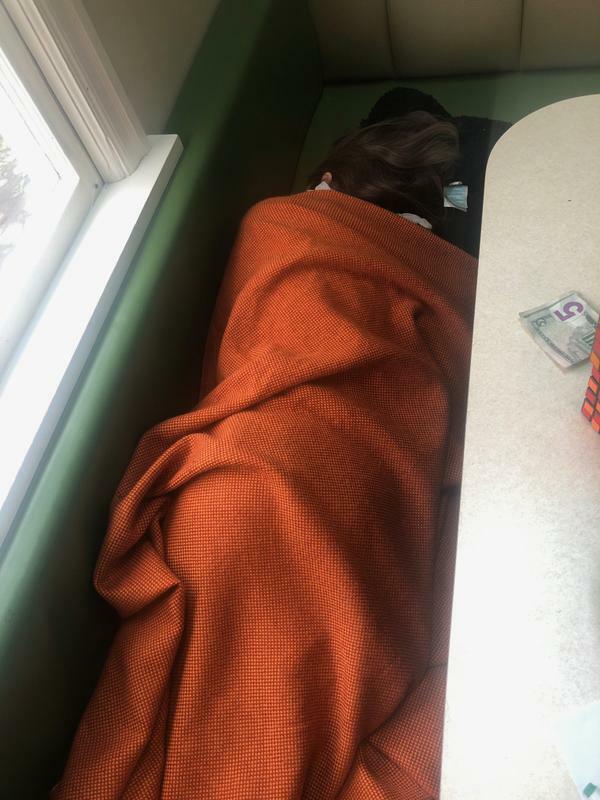 She fell asleep in our bed, and when I moved her to her bed, I put a five-dollar bill under her pillow. Jane was off to the gym in the morning when Annie came into our bedroom with Lambie, her favorite lovey, looking playful, but still upset. “I wanted two two-dollar bills,” she told me. Without knowing what I was doing or why, I picked up Joe-Bear, the little black teddy bear that I sometimes sleep with. “But that’s what I wanted. I’m mad,” she said. Her tone was still playful. But definitely-regressed to about five or six. We’ve been working on the concept of “being mad without being mean.” She was doing that well. I made a mental note to praise her about it later. The conversation between Joe-Bear, Lambie, Annie, and I became one of mainly Joe-Bear and Lambie talking. Joe-Bear seemed to be expressing Annie’s thoughts, and Lambie was a compassionate adult. A few moments after I poured milk into the bowls for cereal, Annie laid down and fell asleep on the kitchen booth. It happened differently with Emmett. Emmett was at a sleepover one night when he was around eleven. At that other house, he lost a tooth. We explained to him that the tooth fairy didn’t make house calls to other people’s houses, and unfortunately (or unconsciously), the next night, when he had returned home, we forgot to put money under his pillow. That next morning, we explained to him that the tooth fairy must have gotten confused because Emmett had spent the night at his friends house and was now back at home. We assured him that the tooth fairy would have it figured it out by the next morning. However, Jane and I forgot again. Emmett came in to tell us about the tooth fairy’s blunder, and I blundered worse, trying to sneak a two-dollar bill under his pillow in the guise of straightening up. He spent a good part of the morning between my lap and sitting in the living room by himself. “I’m taking the tooth with me to school,” he said. “OK. That’s fair,” Jane said. “It just doesn’t feel right,” he said. “No. No it doesn’t,” Jane said. When I was on 33rd Street to pick him up after school, he rushed towards me. His face was filled with light. He was holding something in his hand. I restated what I had heard him say to make certain I understood. He lost the tooth he had lost the other night somewhere at school and this was a second lost tooth – one he lost at school that very day. If you grow up in a cave, the first time you see the sun, you are going to be scared and want to be back in the cave, where things made sense and you were comfortable. And you’ll want to pretend that you never saw that sun. It is wise for each of us to ask ourselves if there are realities before us we are willfully ignoring. Is there some truth, some reality, that you just don’t want to see? Do you have a problem with eating, drinking, shopping? Does a friend tell you one thing about your relationship but act differently? Might you have a loved one who is sick or dying who you don’t want to believe is anything but healthy? Are you like Joe-Bear believing in the tooth fairy even if the tooth fairy isn’t really real? Maybe it’s time to take stock and, though painful, grow-up. You want to know why “they” don’t just give up their ridiculous delusions? Same reason you don’t want to deal with the truths you don’t want to deal with – no one wants to see the truth that they don’t want to see. 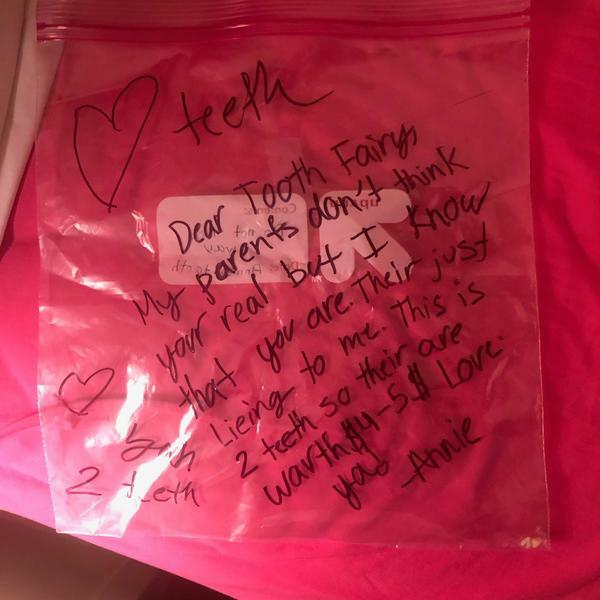 My kids had to do with the tooth-fairy. And, you might have to face the fact that a person you love is horribly disappointing. No one likes transforming; we like having been transformed. But, to be transformed we have to go through the discomfort of transformation. Even if we would rather take a nap. It is two week since the “revelation” about the tooth fairy. Annie spent time today cleaning out her cubby. And, in doing so, found a bag from the summer with two of her baby-teeth. My parents don’t think you’re real but I that that you are. They’re just lying to me. This is 2 teeth so they’re worth $4-$5. It would be good for us to remember this – we, our dearest ones, and our deepest enemies all would rather believe what we want to believe, than the reality before us. We should be patient and compassionate to those who are deluded, patient and compassionate with ourselves when we are deluded, and constantly strive to shake off our false beliefs, no matter how comfortable they may be.